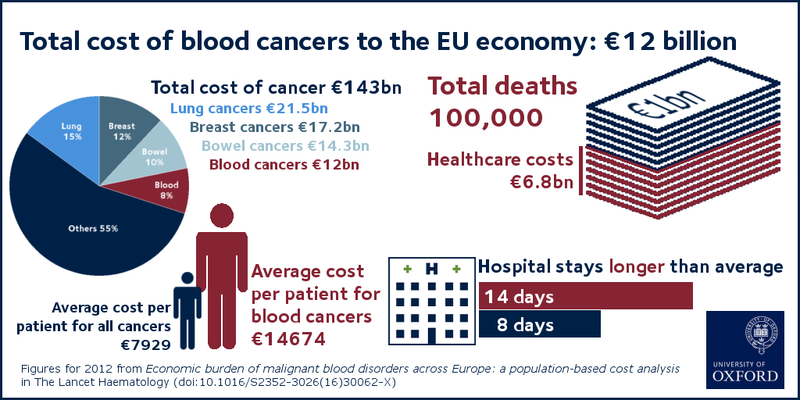 Blood disorders cost the European economy a total of €23 billion in 2012, while healthcare costs per patient with blood cancers are two times higher than average cancer costs, due to long hospital stays and complex treatment and diagnosis. Those are results from two studies published in The Lancet Haematology. Blood cancers are also associated with considerable healthcare costs with the cost of treating one patient approximately two times higher than the average cost per patient across all cancers. Blood disorders include a range of disorders such as anaemia, blood cancers, haemorrhagic disorders, blood cell disorders and disorders of the spleen of immune mechanism. The most common blood disorder is anaemia which reduces the number of red blood cells, hampering the ability of blood to carry oxygen. Blood cancers (e.g. Hodgkin's lymphoma, non-Hodgkin lymphoma, multiple myeloma, and leukaemia) are one of the 10 most common forms of cancer and are responsible for approximately 100,000 deaths in Europe every year. The two studies aimed to estimate the economic cost of all types of blood disorders (malignant and non-malignant) for 2012 for all 28 EU countries as well as Iceland, Norway, and Switzerland. Costs considered included health care costs (including the cost of drugs), informal care costs (from friends and relatives) and productivity losses (due to premature death, and people being unable to work due to illness). The studies were conducted by a team of researchers from the Health Economics Research Centre, at the Nuffield Department of Population Health, University of Oxford, UK, and from King’s College London, Institute of Cancer Policy and KHP Cancer Centre, UK. They collated data obtained from international health organisations (WHO and EUROSTAT), as well as national ministries of health and statistical institutes to estimate the total costs of blood disorders. 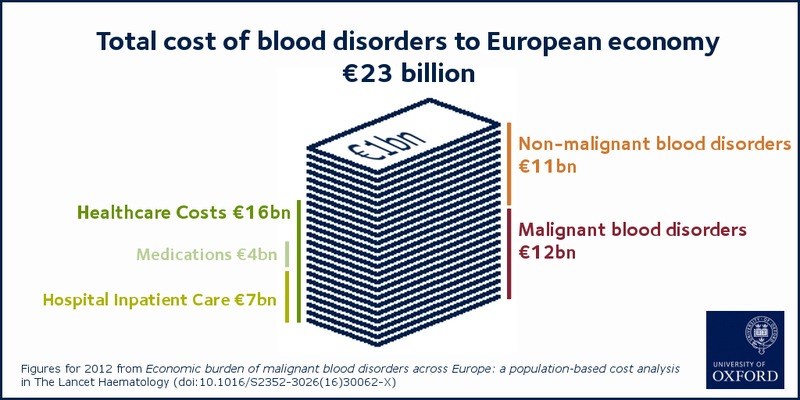 The total economic cost of all blood disorders to the 31 European countries was €23 billion in 2012 – approximately half of all costs were related to malignant (€12 billion) and half to non-malignant (€11 billion) blood disorders. Healthcare costs represented a total of €16 billion and more than two thirds of this was spent on hospital inpatient care (€7 billion) and medications (€4 billion). In the 28 EU countries, blood cancers represented 8% of the total cancer costs (€143 billion), meaning that blood cancers are the fourth most expensive type of cancer after lung (15%), breast (12%) and colorectal (10%) cancers. When considering healthcare costs alone (primary care, A&E, hospital inpatient and outpatient care and drugs) blood cancers were second only to breast cancers (12% vs 13% of healthcare costs for all cancers). Blood cancers cost on average €14674 per patient in 2012, almost two times higher than the average cost per patient across all cancers (€7929). The authors say this is most likely to be due to the longer length of hospital stay for blood cancers (14 days on average, compared to 8 days across all cancers), and because blood cancers are increasingly treated with complex, long-term treatments including bone marrow transplants, multi-agent chemotherapy and radiotherapy, and extensive diagnostic procedures. Costs varied widely between countries, the reasons for which require further investigation. For instance, average inpatient days for blood cancers varied from 8 in France to 48 in Greece; and the average healthcare costs in Finland were nearly twice as high as in Belgium (€18014 vs €9596), despite both countries having similar national income per capita.